So, I just recently finished reading Warm Bodies by Isaac Marion. I have to say that I liked the book. It’s different than the book that I typically read, in a good way. And having watched the movie first, the movie did follow the book pretty closely. Anyway, if you liked the movie, then I would have to recommend the book. I can’t really remember how I found this list but I have to say that I would like to add at least one more person to the list. I would like to add Peyton List. I originally saw her on an episode of Moonlight and remembered her because of her eyes when I recently watched The Tomorrow People. I personally find her eyes to be extremely striking and memorable. 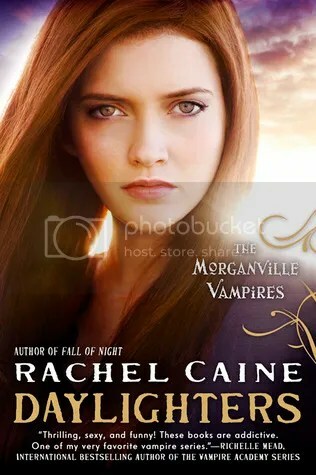 So, I finished reading Daylighters by Rachel Caine, the last book in The Morganville Vampires series. I have bittersweet feelings about this being the last book. On one hand, I’m glad that the series is over, because I won’t have to wait for a new book to come out. But on the other hand, I wish the series would continue. If you haven’t read the book, don’t read any further. Anyway, as for my review of the book, for the most part, I liked it. I liked how the story went with Michael finally becoming human again. However, there is something that I have a question about. I was wondering what the significance of Fallon looking into Amelie’s bloodline, in terms of vampires that she created. Was there something special about her and her bloodline that helped create the cure or made vampires more or less susceptible to the cure? That was the only question I had. Anyway, I have to say that based on how the epilogue ended, I think it could potentially lead into a spin-off series. It could show Morganville, let’s say twenty years from the ending of the book, and show any kids that came from Claire and Shane, and Michael and Eve, and show how things might or might not have changed. I would read that series.